A fantastic collection of talks, exhibitions, showrooms, design tours and more, Copenhagen Design Week covered every area of both beautiful and socially responsible design. I've gone to design shows in quite a few countries including many shows in the US on a regular basis. Honestly, I've never been so inspired, never have been so touched both personally and professionally, as I have been by attending this series of exhibitions. It was more than a design exhibition, it culminated with a reawakened design philosophy within my brain and my soul. The Index Awards, at which I was present at the Opera House, was a centerpiece of the week. Please read more about the Index Awards. Thank you so much Aura/Ida Corr for the lovely song and for creating the right atmosphere. I offer you all a warm welcome to the Copenhagen Design Week. For the second time, Copenhagen Design Week welcomes international designers, architects, CEOs, design managers, researchers and students to six days devoted to design. What is the importance of design? Why should we bother? What is it that design can do for you? For me? For all of us? Society is changing and the world as we know it is slowly turning upside down. We face new challenges and opportunities. Our life expectancy is growing and so is the world population. The Western welfare systems are under pressure while the middle classes are booming in Brazil, Russia, India and China. Resources are dwindling while demand is growing and the whole economy is under reconstruction. The facts of the modern, global society call for action. We cannot address new challenges with traditional solutions. And we cannot wait for someone else to take action. All of us – nations, global communities, companies and individuals – need to think – and to design new solutions for our longer and safer and cleaner lives. It is time to design the world we want to live in, and anyone interested in form, function, shape and seduction should pay attention. Magazines – and the popular belief – will tell you, that design is all about beautiful things. And this is absolutely right. Beauty lies in form and function, and beauty lies in great design…. In Jaguars and Egg Chairs, in Yves Saint Laurent dresses and Erik Magnussen’s jug. Beauty lies in intelligent solutions. Beauty lies in Novo Nordisk’s insulin pen that empowers people with diabetes. Beauty lies in the fact that they are no longer patients. But people. Beauty lies in products and solutions that help us become better people. And design can really do that. Design can really change who we are, what we do and how we behave. Smart phones are not making us smarter, but they are changing the ways in which we navigate and interact in our daily lives. They are changing our physical and social behaviour. We are a designing species, and the designs we make design us in return. This basic understanding is, I believe, the central element in the Danish design DNA. The first golden age of Danish design coincided with the building of the welfare state in the 50s and 60s. The chairs, the lamps, the cutlery, the buildings were all part of an effort to create new ways of human interaction. Danish design has always been intimately linked to our humanistic and democratic traditions: The traditions of Folk High Schools and Co-ops; the tradition of sustainable solutions and pragmatic products; the tradition of designing for the community and of social inclusion. We are at the beginning of a second golden age of Danish Design. And this time we are not alone, because the whole world is at the beginning of a golden age of design. Today, design is much more than styling; much more than form and function. Today design is an instrument for developing innovative, competitive and sustainable products and solutions in order to meet the complex challenges of today’s society. A holistic grasp of the big picture is a key condition for creating meaningful design solutions. The humanistic tradition has for decades been the basis of Danish product design, and it is now a driving force in the role of the designer in a complex world. So, design has come to mean more than giving form; it is increasingly becoming a strategic element in innovation processes in the private as well as in the public sector. To help this process along, the Danish Government last year established the Design 2020 Committee with the vision of making Denmark a society where the use of design is integrated at all levels to improve the quality of peoples’ lives, creating economic value for businesses and improving efficiency and quality in the public sector. It is very simple, really. The essence of design is thinking human. The essence of design is making products and solutions for human beings with minds and bodies and desires and aspirations and social needs and wishes. Design is not the answer to every question we can ask. But it is my experience that if you involve designers in your search for answers, the answers will involve thinking human. Beauty lies in this. 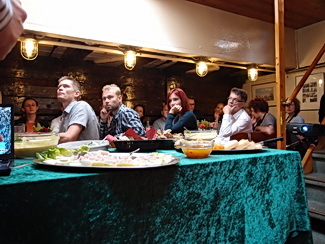 Talk in an antique boat given by IKEA - participants on each side of center tableI am proud and happy to welcome you all to Copenhagen Design Week. The programme is full of beautiful solutions to complex challenges, and they will show us ways to a more sustainable future based on the ability and the willingness to Think Human. Copenhagen Design Week explores and raises awareness of the impact of design, architecture and the environment on human life. In a world of constant change, design has the potential to transform ideas and social values, meet desires and needs – and, not least, create good business outcomes. We firmly believe that Copenhagen Design Week will show us the way to a more sustainable future based on the ability and the willingness to Think Human. There is plenty of work to do – but the future starts now. Dance with the Egg Chair at Official Opening of Copenhagen Design WeekLet me conclude by pointing out three things you cannot miss during the Design Week. First of all - go to Kvæsthusmolen by The Royal Danish Playhouse on the Copenhagen harbor front. 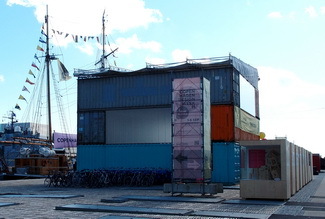 Here you will find the Design Zone, which is the venue for the main exhibitions during the Copenhagen Design Week. Here you will see how design and architecture meet local and global challenges. Secondly – Kvæsthusmolen is also the venue for the INDEX: exhibition, and you will be able to study the winning projects. The INDEX: exhibition illustrates that design has the environmental, social, and economically sustainable tools to make the world a safer and better environment for people. And naturally, I recommend a visit to our exhibition right here, in the Danish Design Centre. The exhibition, Challenge Society, pinpoints the role of designers in solving the grand challenges of our society. HRH Prince Frederik applauding enthusiastically after a performance at the official opening of Copenhagen Design Week (yes, he was one row in front of me! )But please be aware – that this is only a fraction of all the exciting experiences that lie ahead during the Copenhagen Design Week. I would like to extend my heartfelt thanks to the Danish Ministry of Economic and Business Affairs and the Danish Enterprise and Construction Agency for supporting the Copenhagen Design Week. An essential aspect of creating and carrying out an event such as the Copenhagen Design Week is to establish strong partnerships. Therefore, I would also like to give a warm thanks to our main partners: IKEA and Nokia. We deeply appreciate your financial support and your expertise on design and your contributions during the Copenhagen Design Week. Finally, please let me offer my sincere thanks to the Copenhagen Design Week team. You make me proud. Danish Design Center immediately following the opening of Copenhagen Design WeekI bid you all a warm welcome and encourage you to seek out some of the many exciting design experiences that Copenhagen is brimming with this week. Now it is my huge pleasure to give the floor to Mr. Frank Jensen, the Lord Mayor of Copenhagen. After that, Tina Højlund of the Royal Ballet will perform the Egg Chair Ballet, followed by Aura, who will take us back to where we started with one of her songs.